Last night, after seeing the beautiful film “20 Feet From Stardom” at The Laemmle’s Playhouse 7, Friand and I walked the mean streets of Pasadena to a place called The Yard House in Paseo Colorado, one of the many open air malls on Colorado Blvd..
Friand has become quite good about checking out restaurant websites before we decide where we’re going. He had actually suggested we try it because it appeared they had an extensive Gardein menu that I would probably enjoy. He did mention, though, that the website claimed that the kitchen could not 100% guarantee no cross-contamination of cooking surfaces, utensils, etc.. That’s ok. When have I gone to eat at a non-vegan restaurant and expected 100% quarantine of my food? Besides, this appears to be turning into the summer of artisan beer for me, so bring it on! 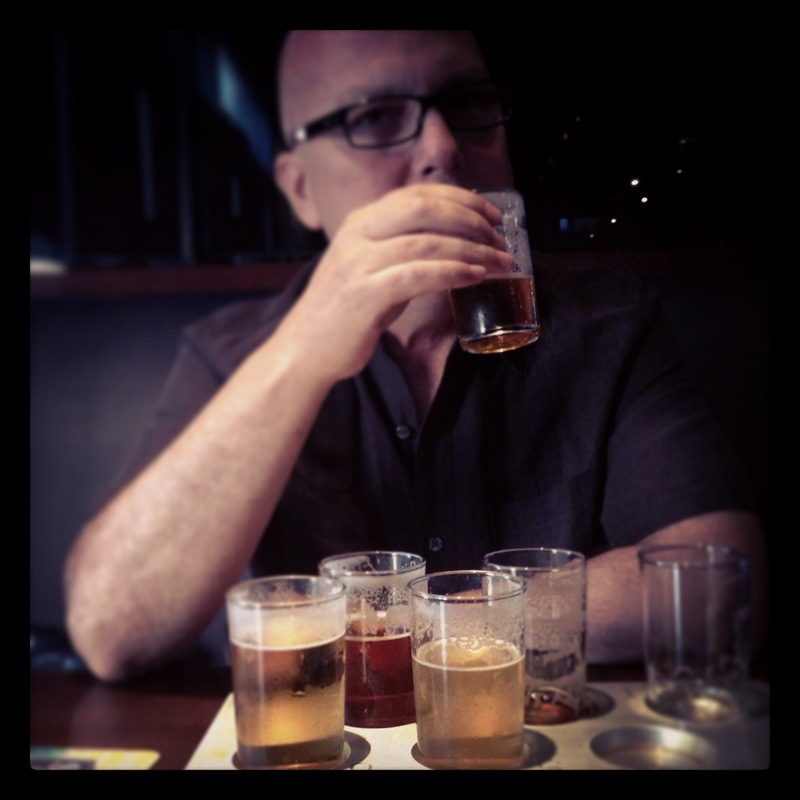 Have I ever mentioned that I am a beer snob? Arriving around 7:30pm, we were actually seated quite quickly and in a window booth overlooking Colorado Blvd! The servers were quick to lower the shades to get the sun out of Friand’s eyes, and even quicker to get our drink order. Friand went for the 6-Pack Sampler while I scanned for a familiar friend: Stone IPA. Yeah yeah, I figured with his sampler I’d have a chance to try some new stuff. I’m so snotty about beer that there’s literally only 4 brews that I will even entertain the thought of drinking: stout, porter, pale ale and IPA (with IPAs being my favorite). Let’s just say, I tried one of the samples on his platter and had to control myself to not spit it out on the floor. To call it swill would have been a kindness. I’m not going to say which beer it was because, let’s face it, I’m not exactly the most openminded about beer and someone out there probably loves it. It’s pure opinion on my part, and I was told “just the facts, ma’am” when writing this blog. (ha!) 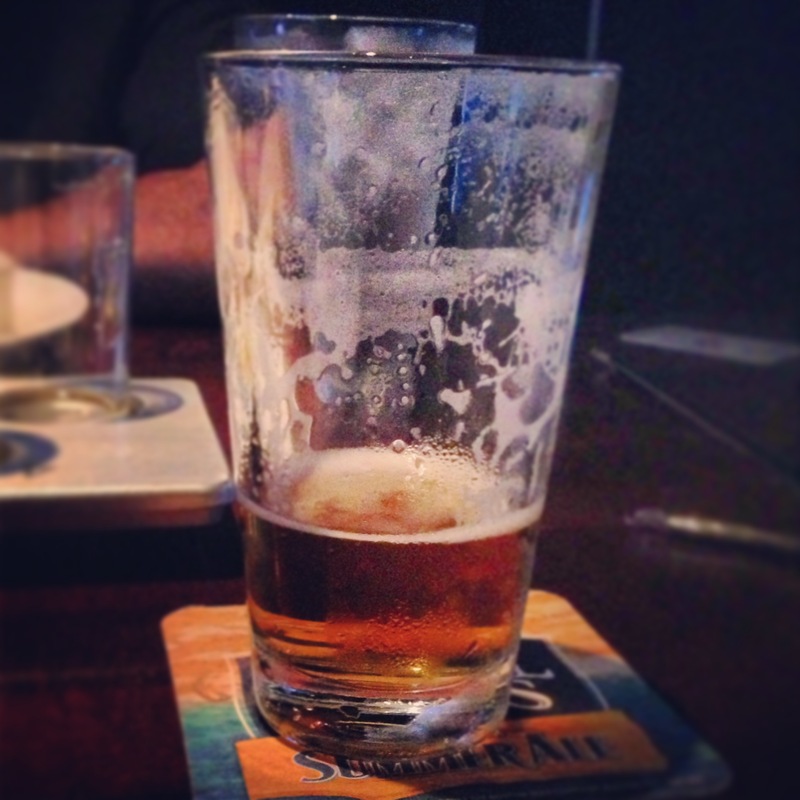 My Stone IPA though was highly enjoyable and turned out to be a great compliment to my meal! Hey, if you get sick, it’s no one’s fault but your own. I’m going to cut to the chase here and say that I did not have even a hint of sickness after this meal. Believe me, I was waiting for it, especially after seeing the grill marks on my Gardein, but it never happened. I have one of the most sensitive stomachs around when it comes to meat & dairy intolerance, and I had nothing. Absolutely nothing. I actually ordered the plain old “Chicken & Avocado Sandwich” because I was feeling sandwichy, though I was wavering between that and a Gardein burger. 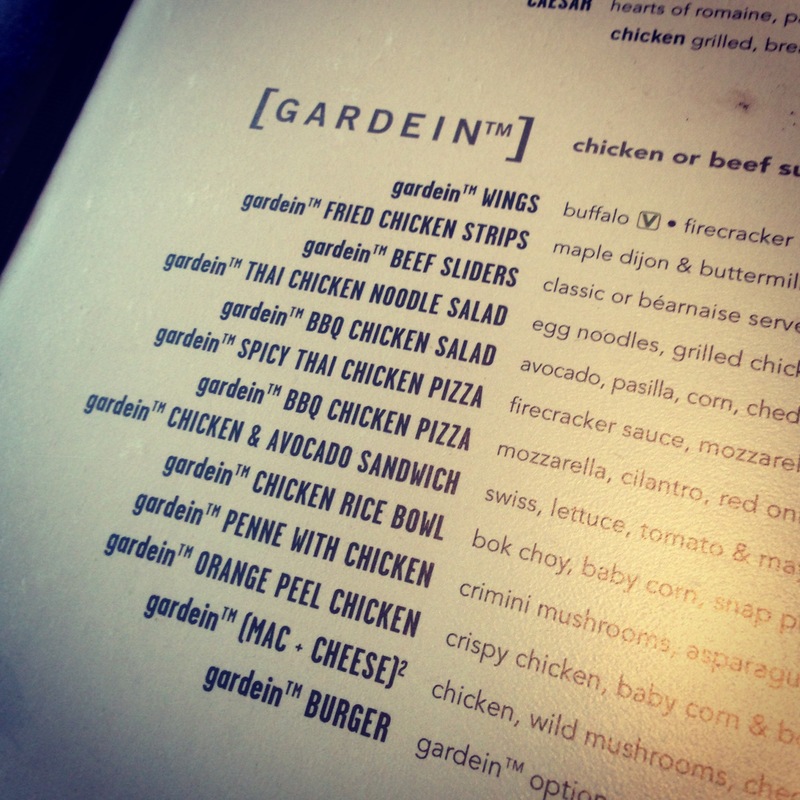 I admit, I don’t think I’ve ever had the Gardein burger patty. Well, maybe next time! When ordering, our server, Katrina, was very receptive and attentitve to my needs. I said, “I’m vegan, and I know that most of these Gardein items are vegetarian…” and she said it would be no problem to remove the cheese. I mentioned the mayo as well, and she said she would bring me ketchup & mustard anyway. Ah, bring it on. I also seem to be on a trashy mustard kick as well. The best part about how she handled my order was that she placed her notepad on the table and wrote everything out clearly (no shorthand) for me to see. Then, she read it back: “That’s a gardein & avocado sandwich, vegan, no cheese, no mayo.” I love it when people are kind and courteous and don’t make you feel like a weirdo. My sandwich arrived and seriously, this could not have been better. You know, sometimes I get a little freaked out by the Gardein chick’n. I’m expecting veins and tendons and weird little animal bits, but nope. It’s all vegetable protein in a very convincing little package. Seriously, feed this to someone, tell them it’s chick’n, and you’ll have them fooled. Actually, I did just that with my son recently: I fed him Gardein crispy chick’n strips without telling him they were veg and he ate the whole plate – not a single crumb left over. After, I told him it was vegan “meat” and he asked if I would buy it for him again. And I did: the Buffalo chick’n wings. He ate those, too. But I digress. The avocado was so perfecly ripe and creamy that I didn’t even need any sort of lubrication on the sandwich. It wasn’t loaded with lettuce orslippery under-ripe tomato. They did a great job with this one. Simple and satisfying. See those French fries in the back? Yeah. Those are obviously made on site because they are super fantastic. I had to fight Friand for my fair share of them! That’s ok, though, I love a satisfied husband tummy. I absolutely recommend Yard House in Pasadena. Between the food and the service, it just doesn’t get any better than this! Thank you for sharing your review. 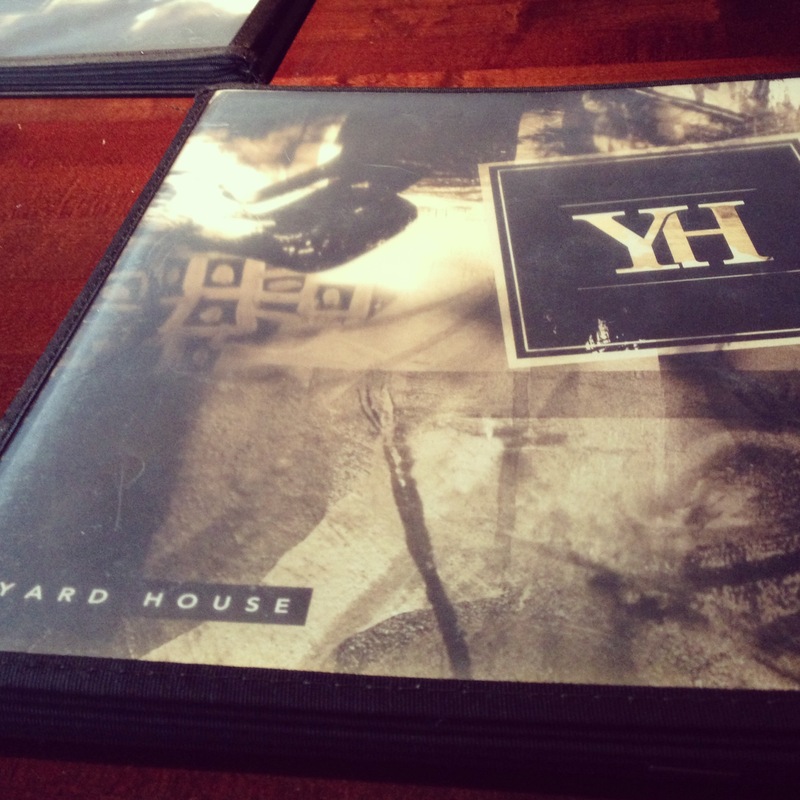 At Yard House, we’re thrilled to learn when we’ve delighted our guests! Our entire team at our Pasadena location is going to be thrilled to learn what a wonderful time you and Friand had. 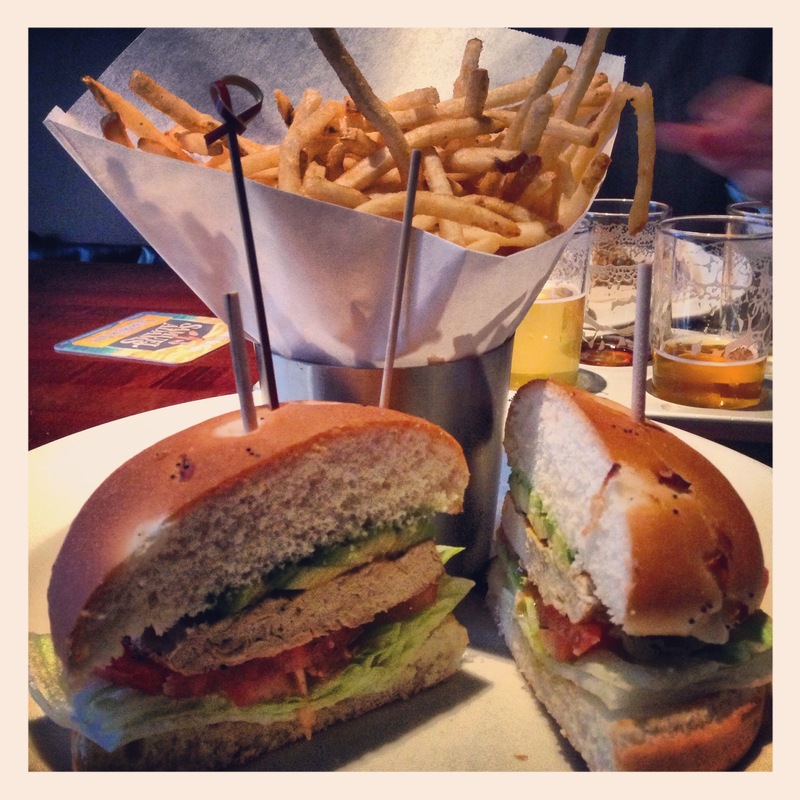 You made favorable references to the Stone IPA and Gardein Menu and specifically the Gardein & Avocado Sandwich. William Adams, our General Manager, will share your email with everyone at the restaurant so they may all know how much you appreciate everything they do. We look forward to serving you again soon. Thanks for letting me know! I’ve eaten there twice since this post and haven’t been sick either time. At the very least, I got lucky and someone back there knew to cook it off the grill for the vegan. Another vegan posted to me on Instagram that the bun looked like it had been egg washed. Again, not certain that was the case because it was a dry bun and I wasn’t ill.